Just days after Turkish president Erdogan vowed to crackdown on currency speculators and launched a probe against JPMorgan for its Friday reco to short the country's currency to 5.90 vs the dollar, on Tuesday Turkish authorities took their vendetta against short sellers to never before seen levels, when taking a page of the Chinese currency manipulation playbook, they made it virtually impossible for foreign investors to short the lira. The overnight swap rate soared more than ten-fold increase over the last two sessions to more than 300%, the highest spike on record going back to the nation’s 2001 financial crisis according to Bloomberg, as offshore funds clamoring to close out long-lira positions failed to find counterparties and the cost of a lira short exploded. Think Volkswagen short squeeze but for a currency. The sudden evaporation of liquidity was partly a result of restrictions imposed by the Banking Regulation and Supervision Agency, or BDDK, imposed during the market rout last summer, which capped the amount of lira that Turkish banks can lend offshore to 25 percent of equity. But, as Bloomberg notes, the situation escalated and a chill descended on the financial sector in Turkey this week after authorities launched investigations into JPMorgan and other banks for allegedly stoking a lira rout on Friday. President Recep Tayyip Erdogan warned on Sunday that bankers deemed responsible for speculating against the currency would be punished. Traders who piled into short-term swaps to scoop up the lira’s juicy 24 percent yield over the past months were caught off guard by the currency’s violent depreciation at the end of last week and rushed for the exit at the same time. As a result, lira liquidity evaporated, sending rates soaring. 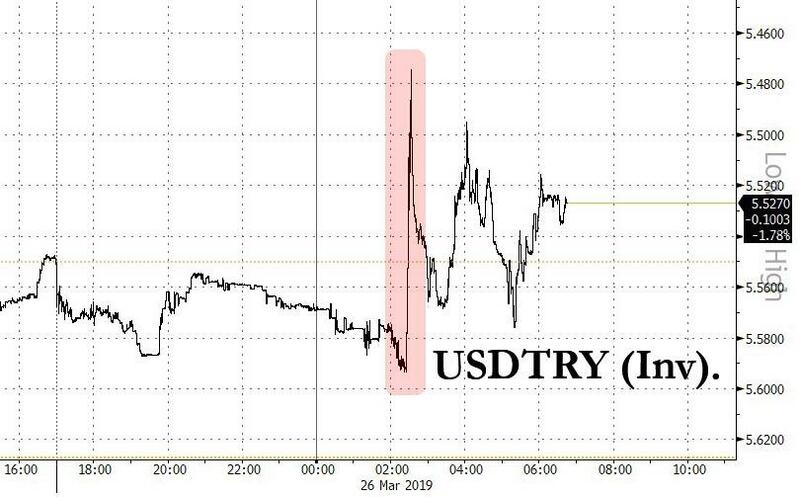 As a result of the forced squeeze, shortly after 2am EDT, the lira suddenly flash smashed more than 2% in a matter of minutes, the latest abrupt move in a jolt of volatility that has taken hold of Turkey’s currency, as the latest round of shorts capitulated. Between 2.26am and 2.33am EDT, the lira spiked to 5.474 against the US dollar, from 5.5592, a rise of some 2. And while much of the sharp gains fizzled over the next hour, shorts have continued to cover their positions as shorting costs remain unsustainable. As the FT notes, the lira’s moves on Tuesday come during a critical time politically, with local elections on Sunday; in order to avoid a sharp devaluation of the currency ahead of the elections, on Monday Turkey’s central bank unveiled a series of operations that helped to prop up the lira, while analysts noted that traders were seeing domestic banks selling large quantities of foreign currency in an apparent attempt to lift the lira.